The Cape Wine 2018 Expo took place at the CTICC from 12 – 14 September 2018, and only takes place every three years. A retrospective view of an extremely successful Cape Wine 2018. An inspiring event that not only showcased South Africa’s best wines but also a study in sustainable eventing, that resonated with the theme ‘hannuwa’, and set a standard worth following. The ancient San word ‘hannuwa’ means the gathering of good fortune through living in sustainable harmony with our natural environment. #hannuwa. Wines of South Africa (WOSA) did not follow the path of a formally audited ”green-event”. The actions taken and processes implemented far exceeded any sustainable event that has been done before. The sustainability claim was based on the fact that it was fully documented, measured and the fact that it can be assessed effectively. The events relationship started with Xanita in 2012. Su Birch pioneered the very first swing to a sustainable product as the backbone of the event; in hindsight, a visionary step forward. Looking back we realise that cultivating grapes and creating wines is very sustainability focused. One of the industries that has been the forerunner and the closest of any to a natural growth path into sustainability. Methods of farming, runner ducks, organic wines, water management and a hundred other influences on our ecosystem; wines and winemakers are heavily invested. So it makes sense that the trophy event that happens every 3 years also naturally migrated towards showcasing sustainability. In 2018 Wines of South Africa again set out to highlight sustainability. Though not formally audited, they ticked a lot of the boxes. Travelling arrangements, accommodation proximity, and flight co ordination helped reduce what could have been a hefty carbon footprint if not managed. With a sustainability aware partner in the CTICC many of the other basic greening aspects were addressed as a matter of course. Waste management, catering, services etc. A conscious decision was made to use fridges versus ice, as a water saving action. In this there lies a small debate on energy versus water, but in the context of what is a water scarce region, the decision was very valid. And the practicalities of these logistics proved that this a well-founded approach. Set on the basic standards that determine event greening – the event was well on par, up to the expected minimum requirements. Although there were stock lanyards and event specific printing – this is a 3 yearly event, compared to an annual event – and as such even these aspects were not far out of sync and will be addressed in future. So where did this event really excel in sustainability? The fact that the bulk of the exhibitor stands were manufactured from a locally manufactured engineered fibre board (EFB). The 160 odd stands varying from 2×2 to 2×6 were all pre-manufactured from Xanita. A material made from recycled paper waste – and completely recyclable. 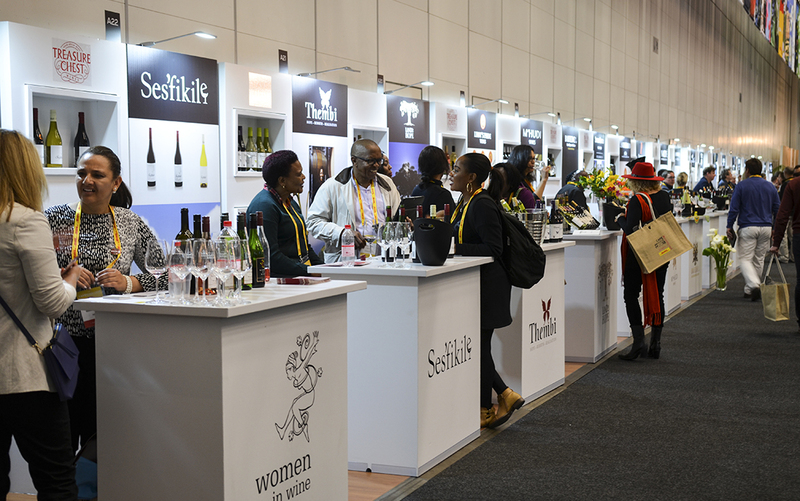 In doing so, WOSA addressed what is the biggest waste factor, and the bulk of any expo – the actual expo stand design, manufacture and installation. They not only used a recyclable material, but the stands were also reusable. With some 70% of the stands being reused. In contrast, some of the larger stands set up were the traditional mdf and plastic variety. Most of these were notably different, with a few, such as Elgin, also following the sustainable route. Most of the other stands used FSC approved timbers, designed for modularity and reuse and integrated repurposed materials. Elements such as logistics are possibly one of the biggest contributors to sustainability. Only 20 staff built all of the 160 booths in less than 24 hours. A feat that could not have been attained using traditional methods. And certainly not with the clean and bespoke look and feel achieved. Transport to site was done in only three containers. Use of pallet jacks to move the components onsite. No pollution of the environment in the halls by dust, noise or residual material. All in all, a very clean build. The contrast between the Xanita stands and the contemporary timber / mdf / spray-painted offerings was clear. A stark contrast that highlighted the obvious need for a cleaner and healthier work environment. The load out again emphasising the sustainable aspects of eco based booths. Comparing based on a m² ratio, the eco-booths took 75% less time to load out with 25% of the labour component. The waste was collected for immediate recycling, with the reused stands packaged and a portion of the stands earmarked for legacy project use. As example, discarded tasting counters were trimmed to a more suitable height and used in schools or by scholars who don’t have a study space at home. Lightweight, moveable and durable – with no negative waste impact post lifecycle. Living the circular economy. Delving deeper into the backend of this kind of event, the contribution to the local economy is far greater than traditional methods. Locally made materials, recycling channels, and a local labour contingent that doesn’t need specialised training for assembly, or risk serious health hazards, unlike other materials. An almost unnoticed aspect is that there is no structural or environmental damage to the CTICC environment. Unlike the damage and pollution caused by contemporary build methods on site. And as imperceptible – the fact that Xanita board creates an acoustic value that cannot be emulated by any other material or system. One could say you had to listen for it. But the sound quality in a busy, noisy expo hall was noticeably better. Afterall, better communication means better sales. All in all, a magical event celebrating the finest wines that South Africa has to offer. And in the background, quietly supporting it, an equally impressive capability that lies within Cape Town, South Africa – to host events that benchmark sustainability globally. Wines, scenery, beauty, warm people and world leading sustainable design. Read more about inspiring and creative stand design in issue 2 of Event Africa.